I have enjoyed your company for quite some time now and am totally enjoying all the inspiration and fun this forum brings to me! 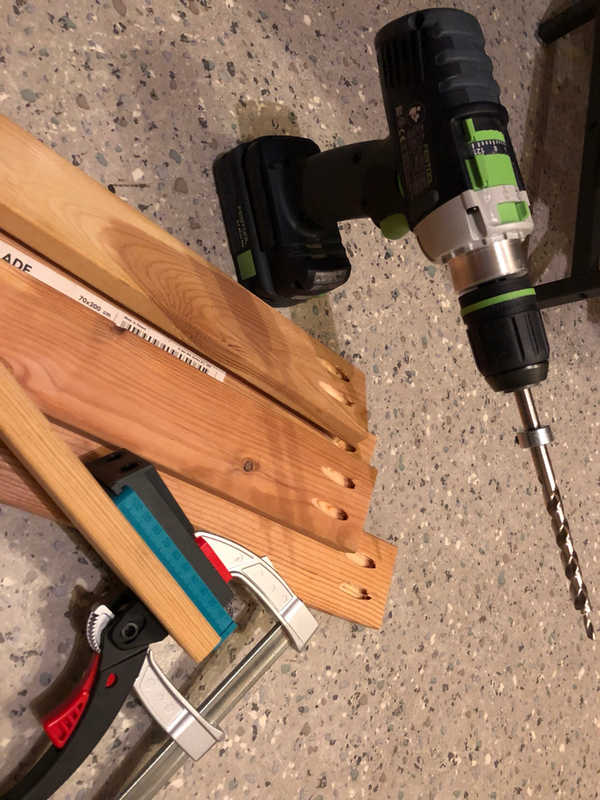 Inspired by @alkaline and @six-point socket II and all the others, I have decided to start a thread of my small adventures into tools and woodworking. 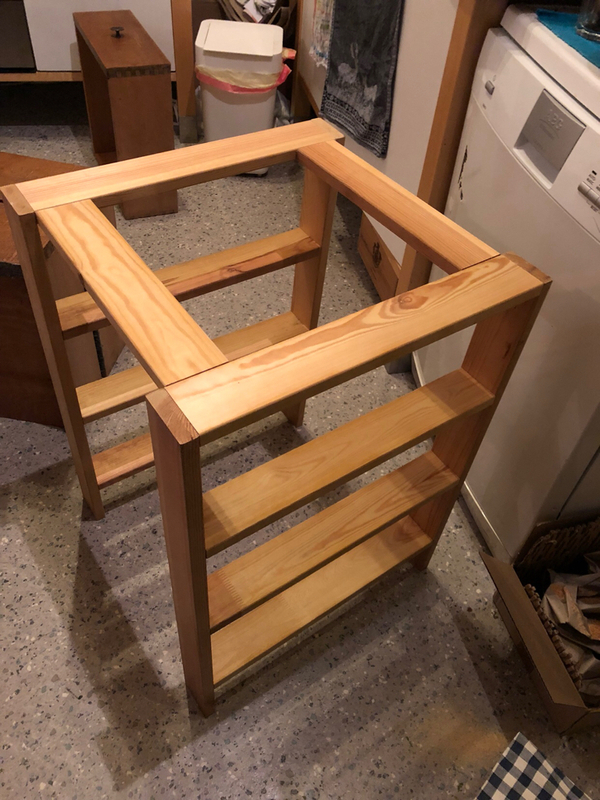 I don‘t have a shop, due to not having any space in my rental flat, so most of my projects are either done in a shared basement/bike storage, outside or a friends and family. 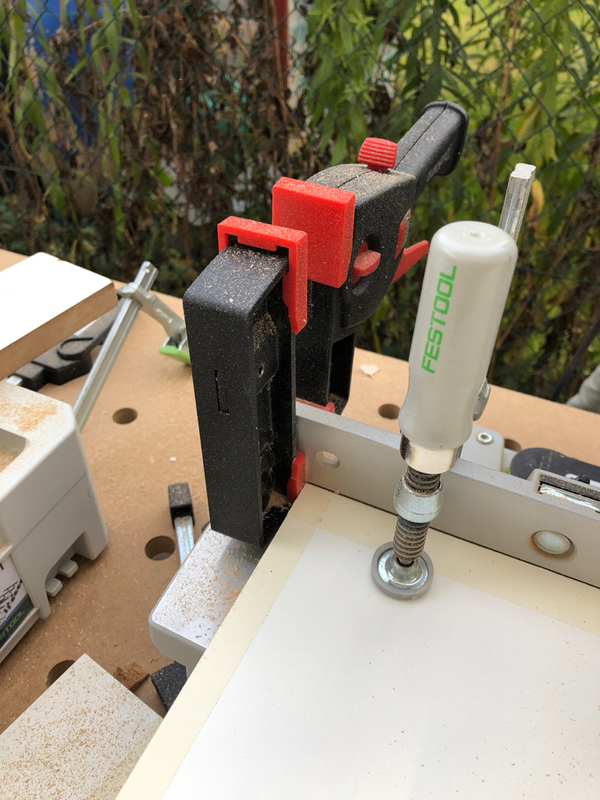 But I love tools and am successfully growing my Festool and general tool collection and am constantly looking for improvements and ways to put them in use. I hope that some of this stuff I‘ll be posting here might do the same, as other posts did to me. Bring ideas or motivate to get up and do something. So, here goes the most recent project. 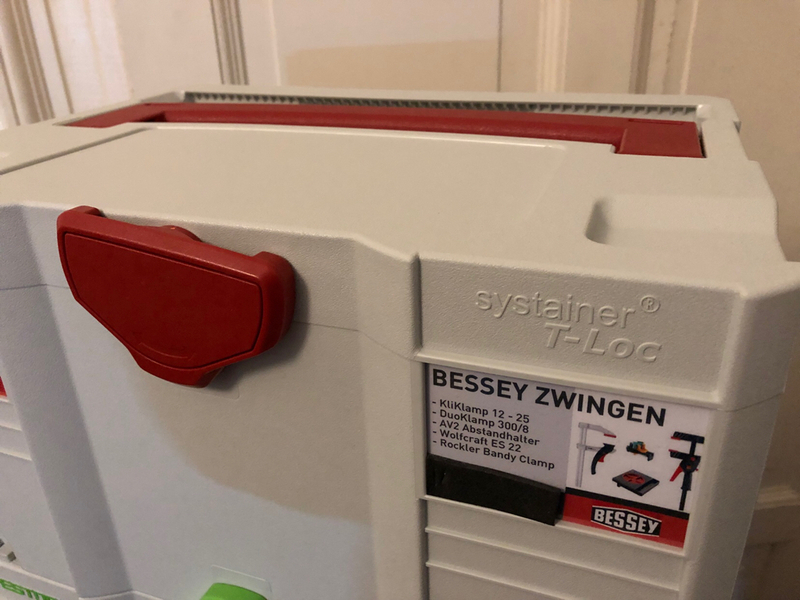 I had been eyeing the Bessey KliKlamp Systainer as an option to have an easily movable clamp storage for everyday needs. 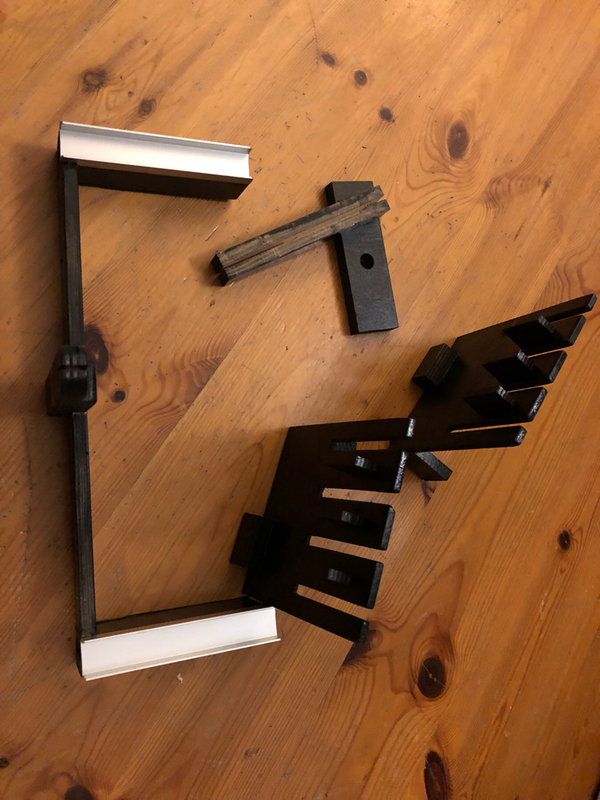 After contemplating the purchase for long and finding inspiration in @Infected98 and his Version of the KliKlamp Storage / upgrade, I decided that KliKlamps only, would not be my choice. I wanted some DuoKlamps and small stuff in there as well. I opted for a SYS 3, to accommodate the DuoKlamps. This leaves enough room for other stuff as well. I don‘t have all the Klamps yet, but it already works nicely. Built the stuff out of scrap wood and some aluminum pieces I had laying around. 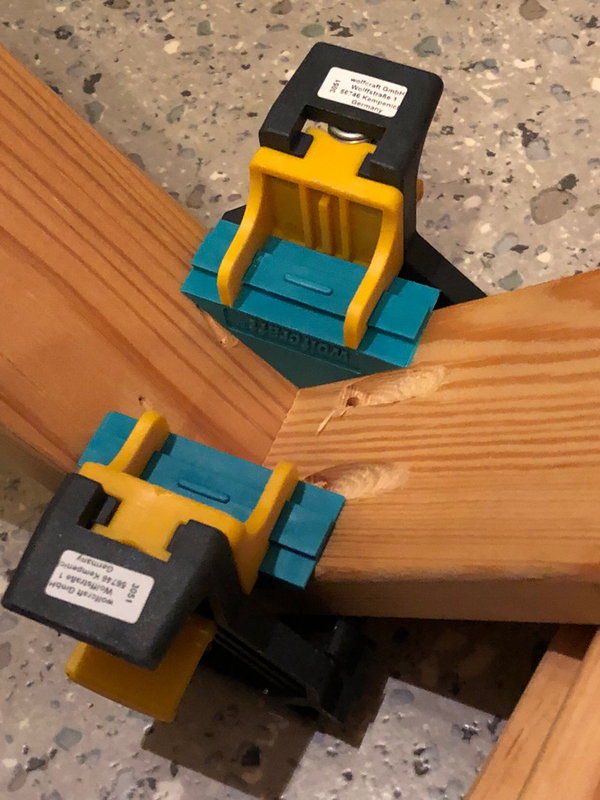 To secure the „tool-holders“ I will glue them in place with „mirror-fixing-tape“ (double sided tape with a layer of foam in the middle). There is also foam rubber below all the wooden parts to eliminate rattling. 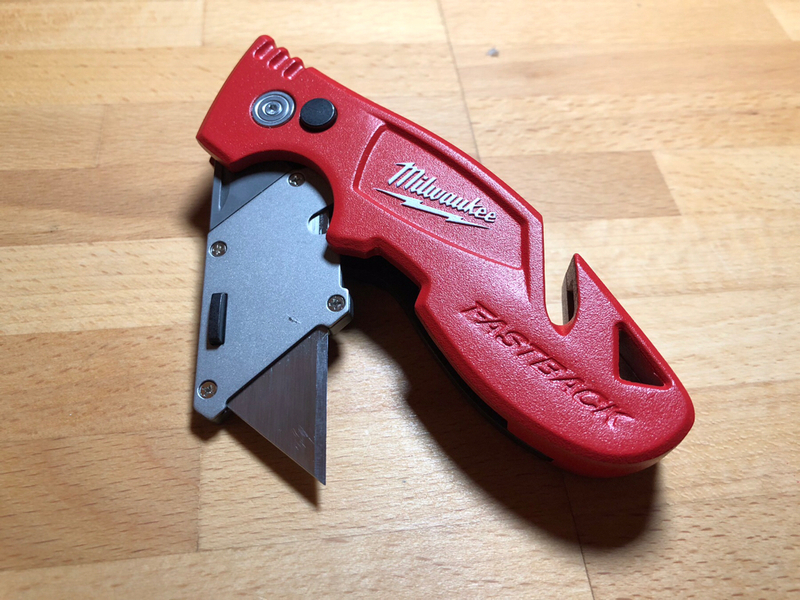 The Milwaukee Fastback 3 foldable utility knife. Nice, grippy thing with integrated blade storage and a beefy belt hook. Like it so far, but it is a little boxy in the hand. The finger indent is massive and gives a great feeling of security. No risk of loosing grip. Look forward to following your thread. I'm afraid if I had one it would be titled "Forays into chaos only." I have not really used it much. But it looks promising. It locks in two positions and build quality seems to be good. I wanted something with blade storage, folding and a good grip. All features are perfect on the Milwaukee. 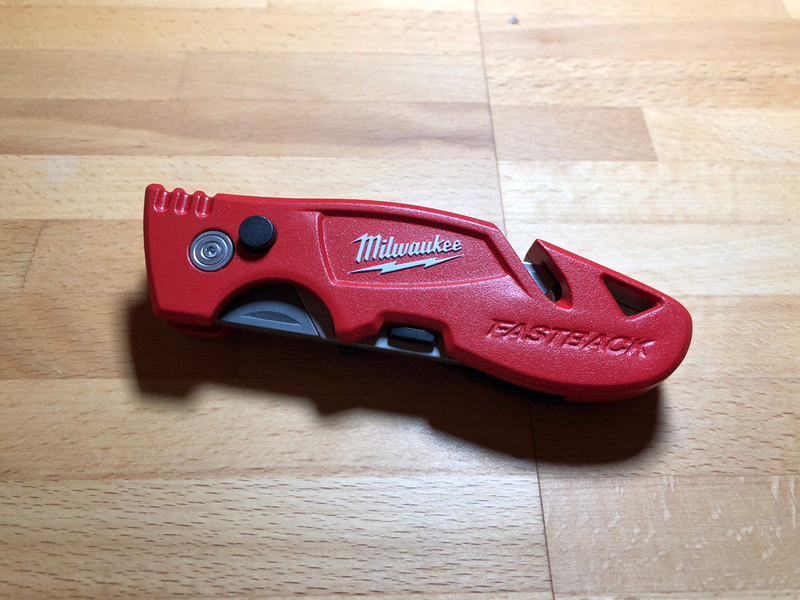 It it only my 2nd Milwaukee tool (have an unused butterfly drill somewhere), but so far they seem to make a lot of thoughtful tools recently. I'll get some more in the future for sure. I am contemplating getting the original Fastback knife as well, since it looked to be slimmer and smoother. But this would just be "because of..". The Fastblade 3 feels like a workhorse. The only shame is the blister packaging. A couple of weeks ago I was able to get some of my equipment to good use, at my Sister in Law’s house. 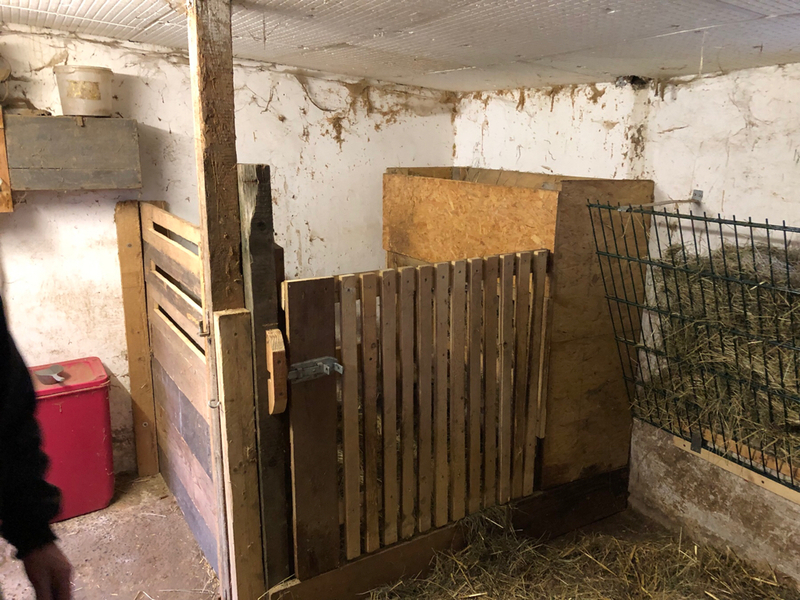 They have a couple of farm animals and the goats needed to have an upgrade to their winter shed. I only carried a small stack of Systainer (PDC, Carvex, Screws, Workbench..) and my newly gifted Wera 2go tool bag. Constantly I am amazed what I am now able to do with the tools I have. And it really makes it so much more fun to do, if you see the faces of people you are able to help. We did what needed to be done in half a day and had blast doing it. The SYS-MFT really made it easy to cut everything in place. 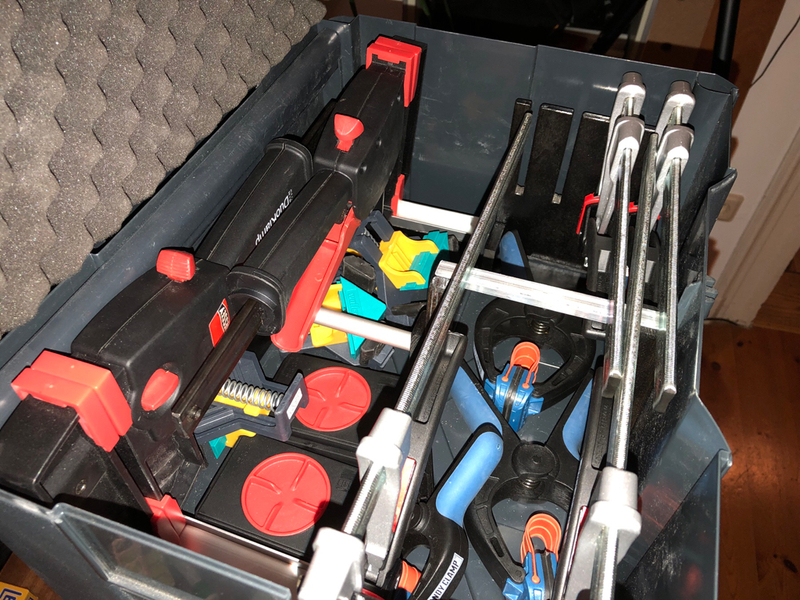 Finally some more progress in getting my toolstack organized. Festool grey, but red handle and lock. Would have preferred a black one, but this one was unbeatable in price.. 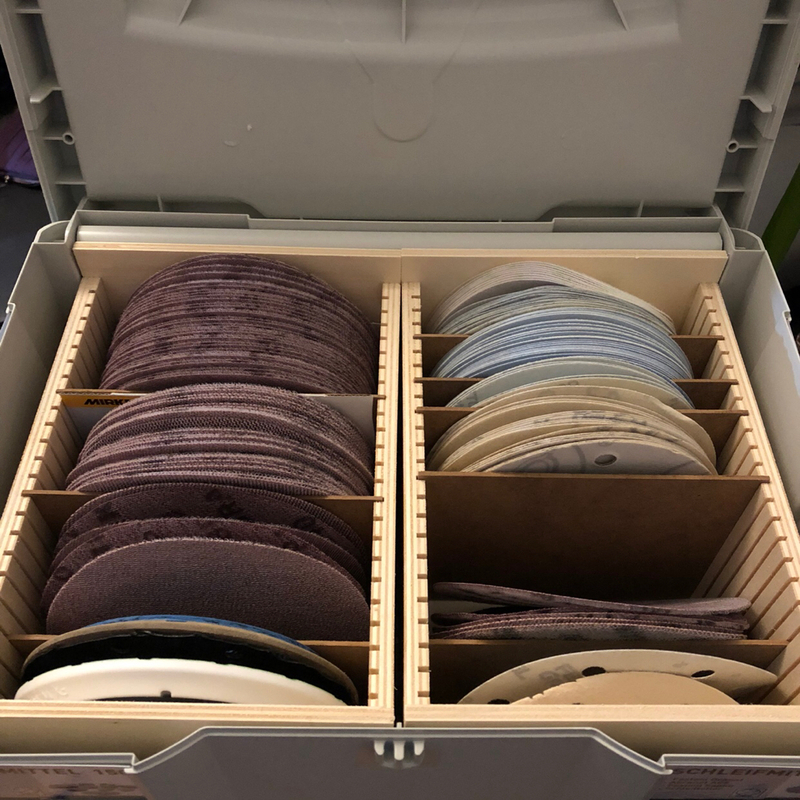 The next step in getting organized is a FOG inspired storage for 150mm/6“ sanding discs. I opted for a „2 box“ design to be able to take the sandpaper to the job, if needed. The boxes are raised slightly to allow some additional large sheets of sandpaper to be stored below. 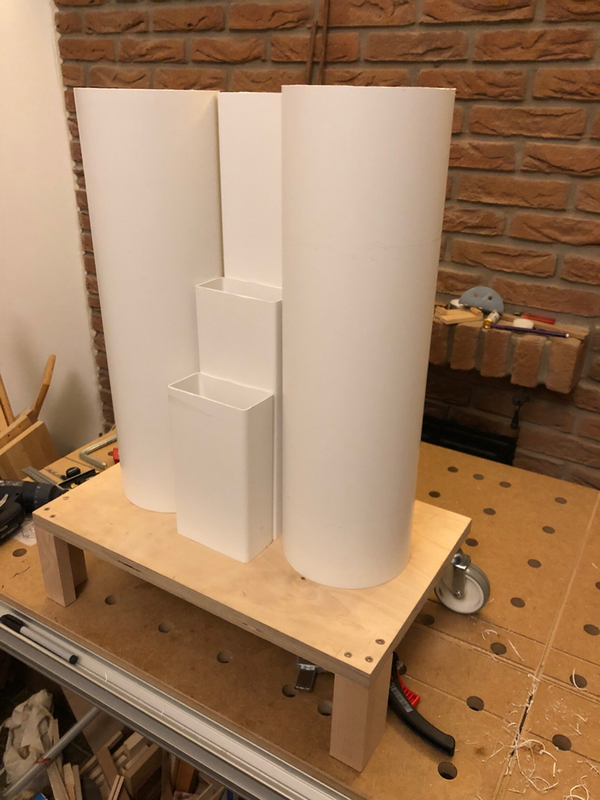 Additional dividers (1.8mm MDF) are needed, but I ran out of MDF. Plus I want to make a solution to store the M8 screws for the ETS EC sanding pads. Thinking of adding a strip of wood with a drilled/tapped hole, but am still undecided. Systainers are addictive! Great organization and simple to stack up and transport. 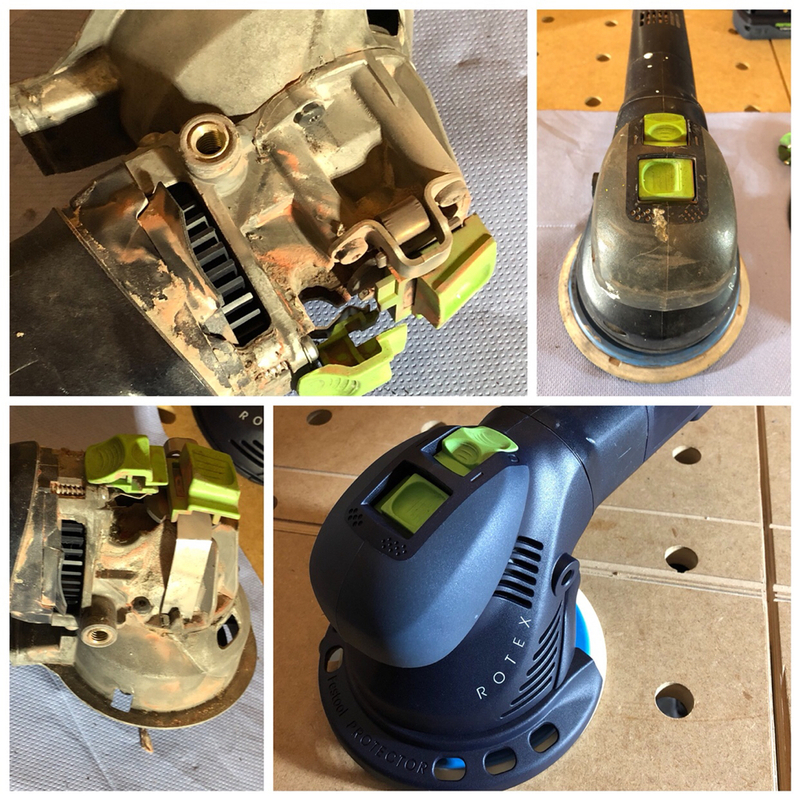 The project leading up to the sandpaper storage was the „renovation“ of a second hand RO-150 I acquired. It was definitely in worse condition than expected, when it arrived. I took the Vac and a long haired artist brush and cleaned it, afterwards it got some new parts to give me the shiny-new-tool feeling. 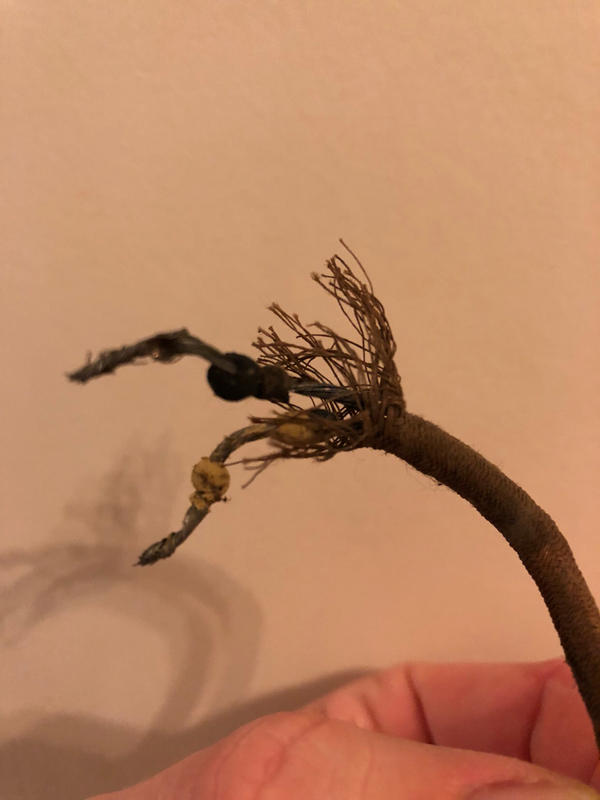 Wow, what a transformation on that Rotex! Great to see another thread like this! Great job on the Rotex! 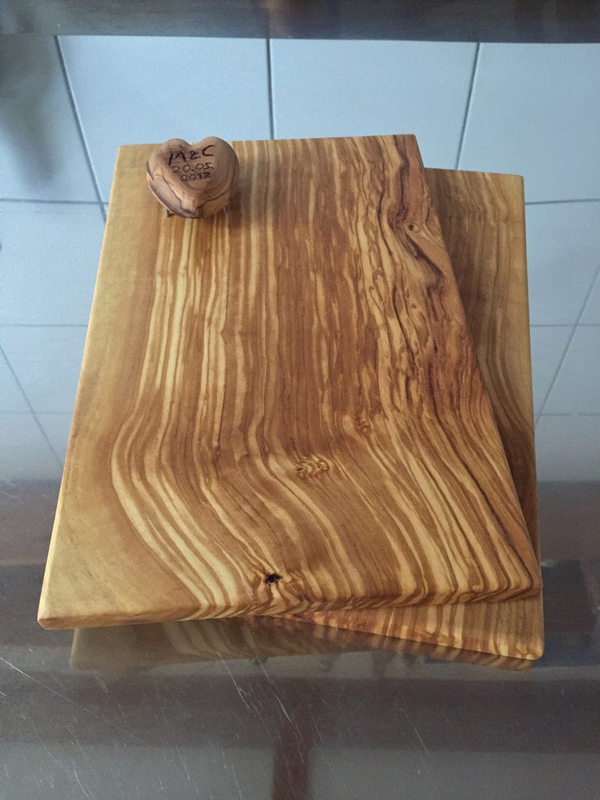 A pair of „breakfast cutting boards“ I made for my best friend for his wedding. I had a piece of olive I bought at my local special wood dealer. Nice to work with and even nicer to look at. Finished with 3 coats of Festool Surfix HD. Also a quick tip in between! I found the perfect stop block for the quick, short cut. 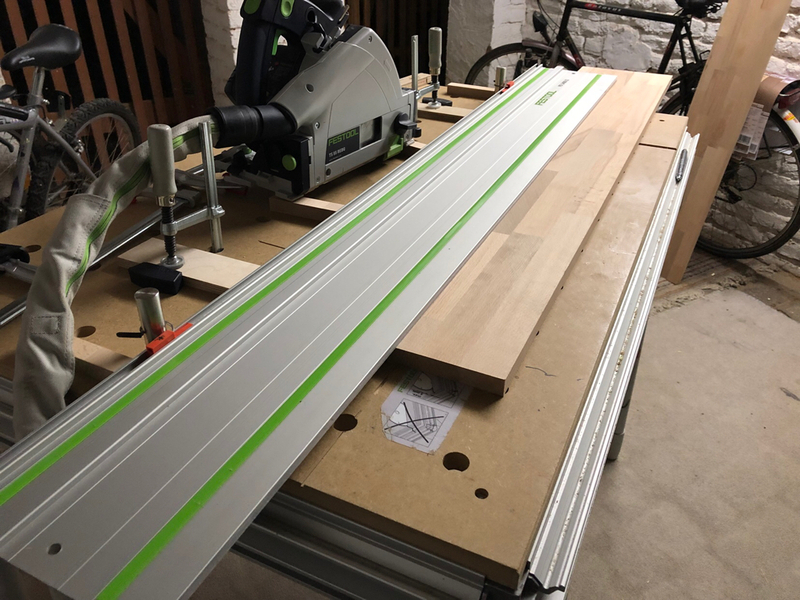 A Bessey DuoKlamp 160-8. Goes on quick and holds nice and fast. Your cut length is fairly limited by geometry, but when the stars align, it works flawlessly. So. I started a new project. I want to build a wardrobe with „shaker-style“ sides. Materials will be beech wood for rails and stiles and white particle board for the „inlays“?! This should make it affordable but hopefully still look nice. 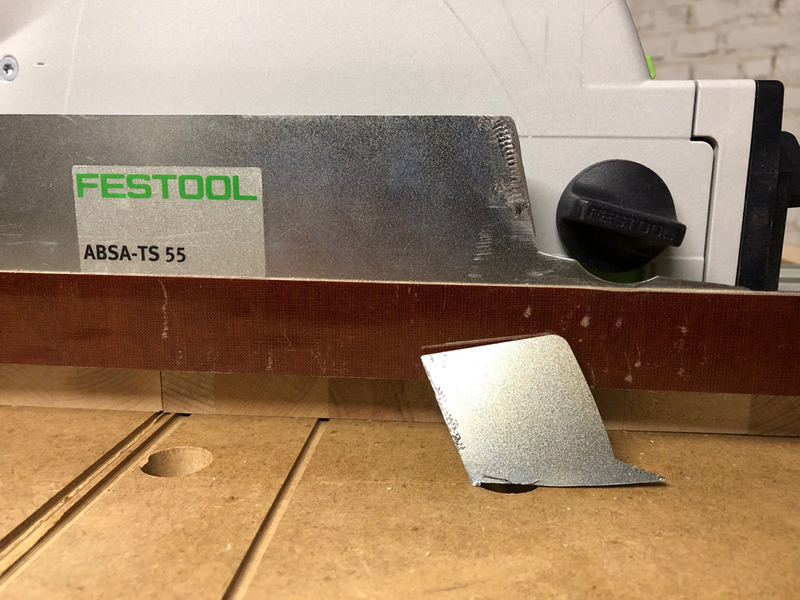 I got out my TS55 to rip the boards I bought at my local home center in two. Worked like a charm with the Panther blade. I spent some time setting up my MFT so I only need one cut and end up with equal width on both sides. Since the resulting board is narrower than the rail, I used scrap wood for stop blocks. 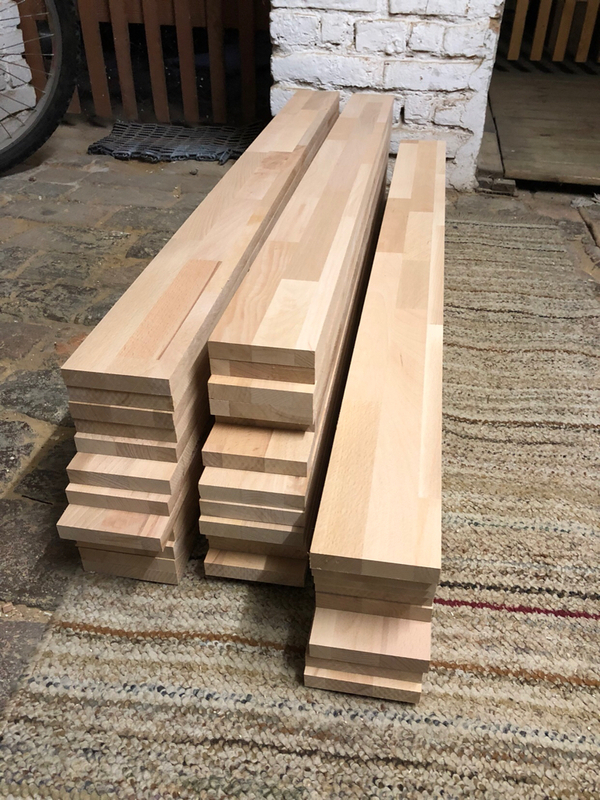 Next step is cutting the boards to length. I will do this on the MFT as well, to be able to cut all the boards for one part of the wardrobe at once. 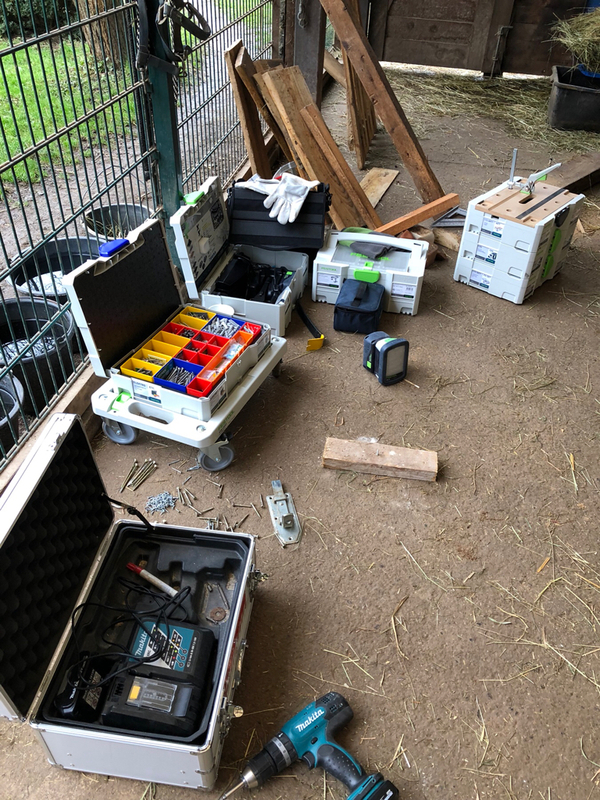 In preparation I was again annoyed by the ABSA-TS55, which I use to avoid sawdust-spray. In its normal state, this does not allow you to have the splinter guard still in place. I wanted to get some stuff done for the multiple projects that are currently occupying all areas of my flat. But I only managed multiple minutes of moving things from A to B. So I decided to relax this evening and went through some of my photos from the last couple of years. 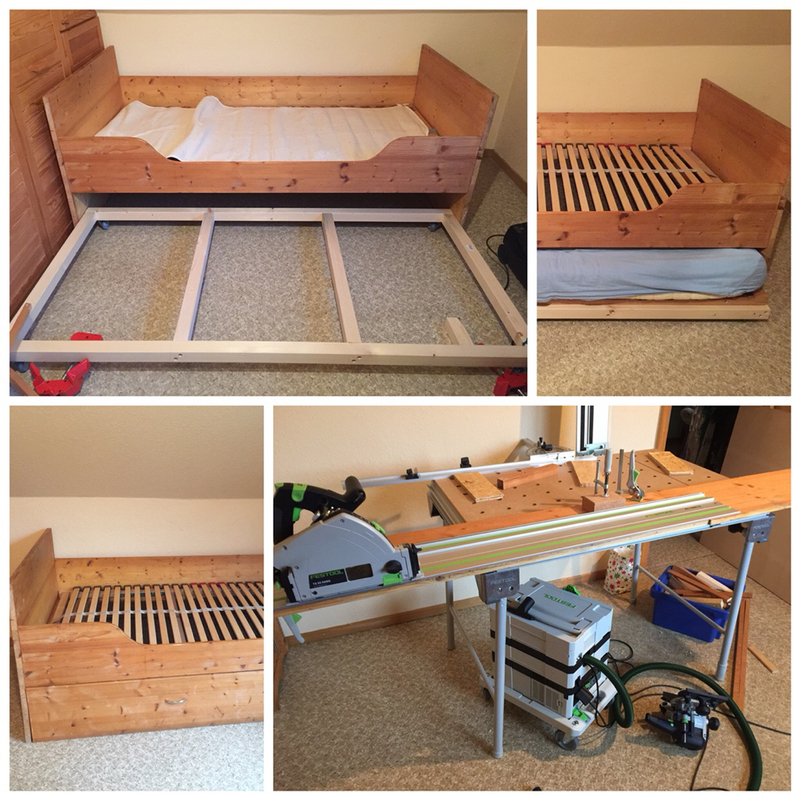 A little more than a year ago I modified the under-bed storage in my Moms guest room to fit an additional mattress. 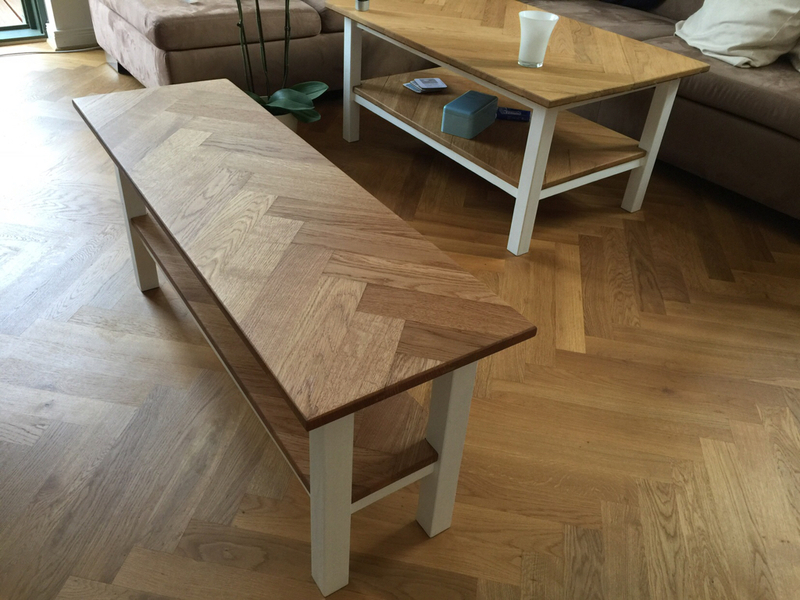 During the last two years I made a pair of tables for the Mrs. She wanted a different sofa table and I suggested to build one matching the herring-bone oak flooring in her living room. 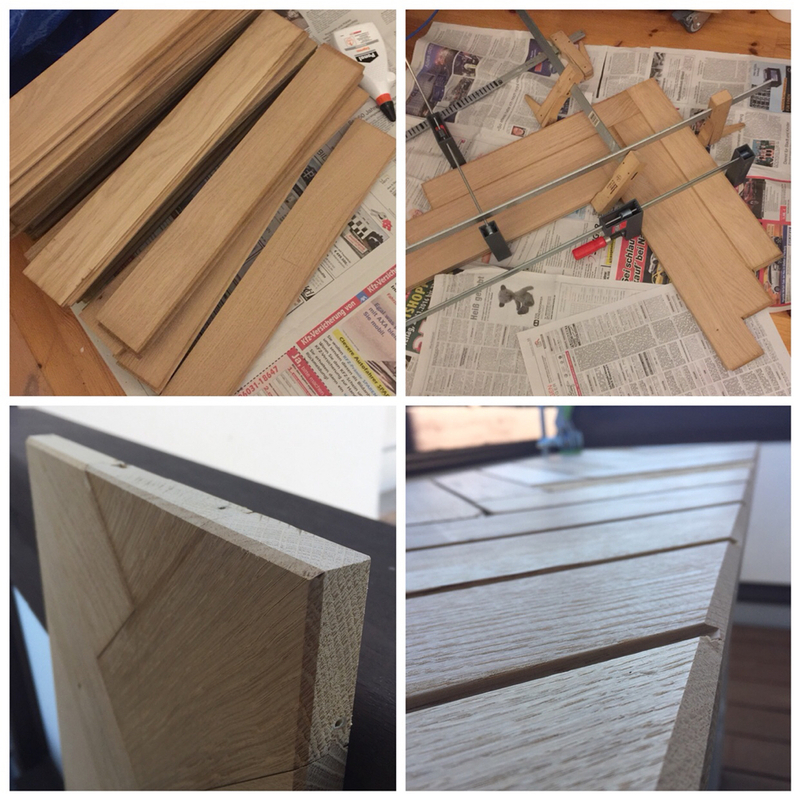 The first table was initially built with round dowels and finished with IKEA mineral oil. After finishing the table I bought the DF-500. 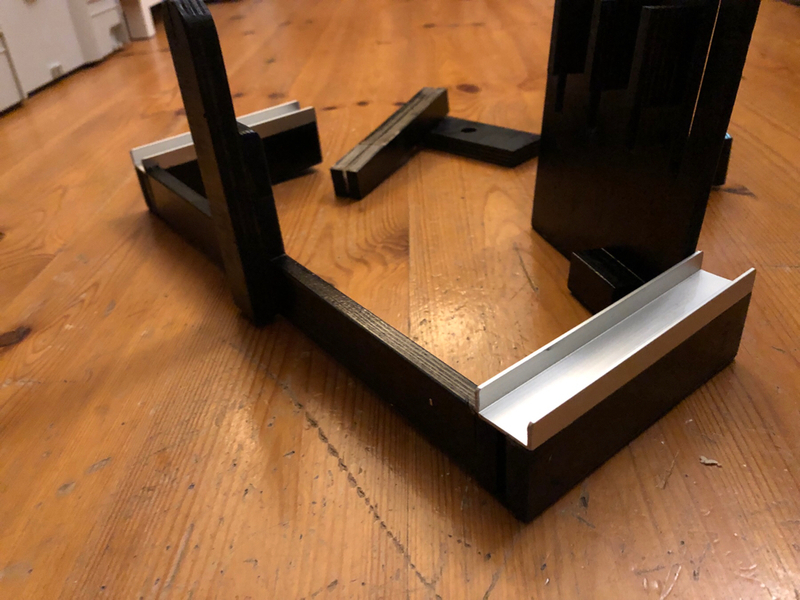 I used that for the TV-table and this made it turn out so much better and sturdy that I went back, sawed the legs apart and re-did the sofa table with Dominos as well. I am still amazed how well they turned out. The table top is just old floor boards glued together. Fixed to the leg with table buttons. The chamfer on the underside makes the grooves of the flooring almost invisible from the top. So. Today I tackled a couple of things that I’ve been pushing off for some time. While I‘m on my way to the new wardrobe, I’ll need a makeshift storage for socks and underwear and such. I had collected three old drawers at a yard sale some years ago. 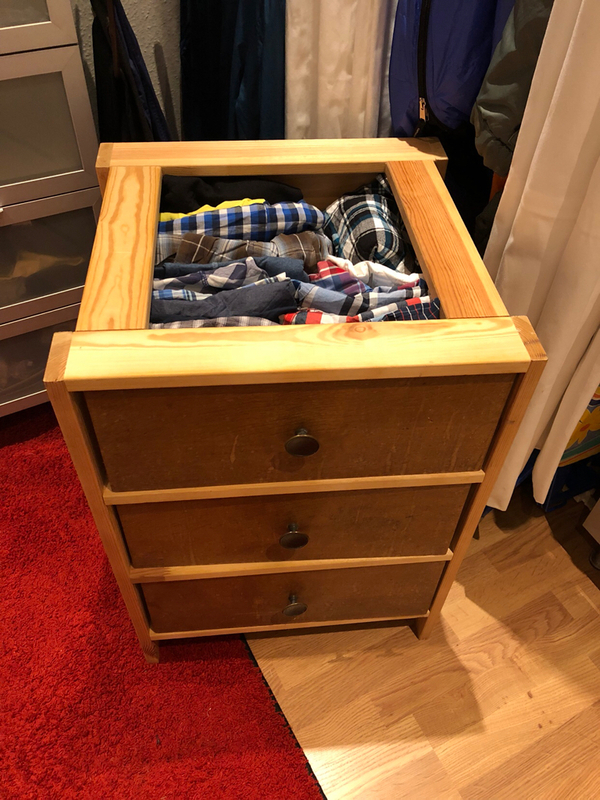 So I decided to quickly whip up a storage solution using these drawers and wood from an old IKEA mattress support. 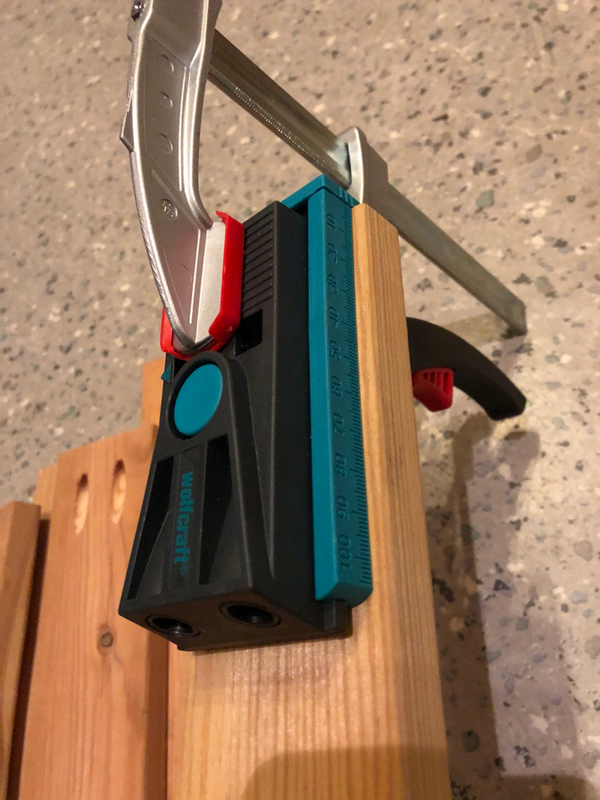 A perfect way to test out the pocket hole jig I just acquired a couple of weeks ago. It is a Wolfcraft. Was thinking about the Kreg R3 for some time, but that is more expensive here in Europe and thus I sprung for the local make. Works well, but I’ll need to make some more pocket holes to perfect the settings etc.. In parallel I cleaned the shower with a chlorine based cleaner. The whole flat smells like a public pool now. 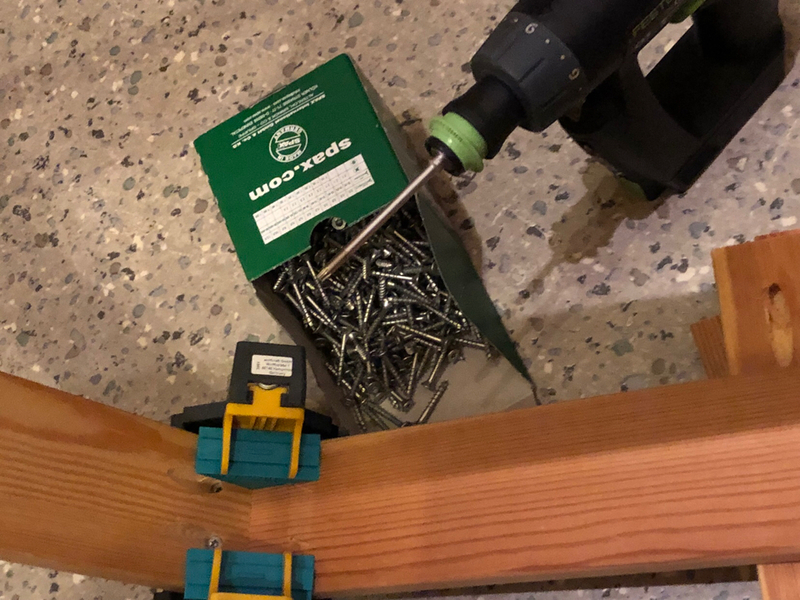 If you ever want to be lazy, instead of scrubbing in the normal sense, put your drill or driver to work. 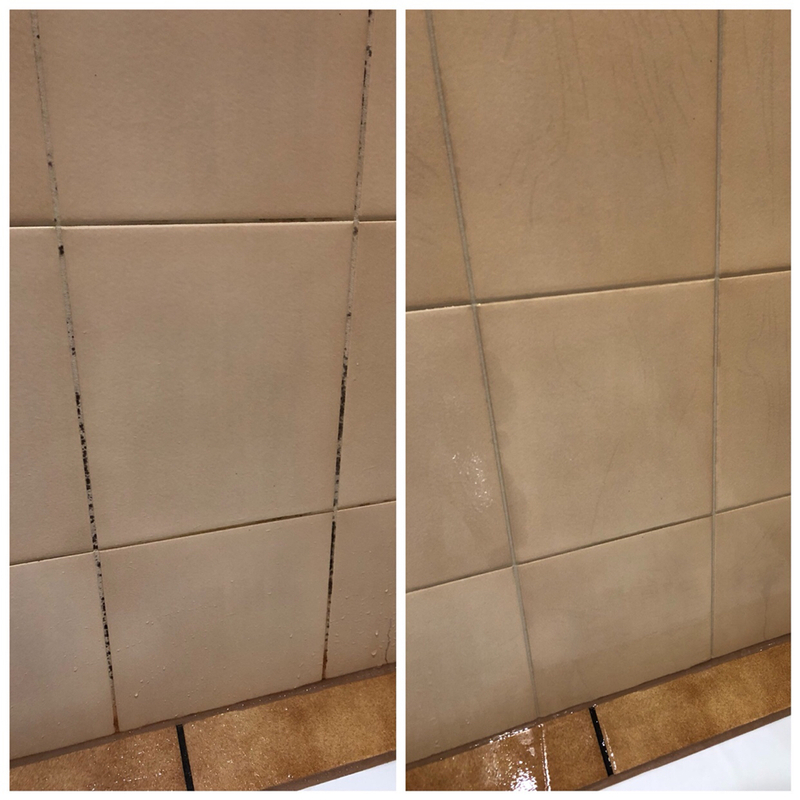 I often use my Milwaukee M12 screwdriver (Reverses) for cleaning, with SoftScrub depending on the tile. Hi @Peter_C I thought about using a drill and getting into it. I had even contemplated getting the tile-grout-cleaning thing that Fein offers for the OMTs. Curious what the name of the stuff you used is. Probably one of those foaming bleach products like Tile-X. Appears to work fine on opaque tile but I get the feeling all it's doing is removing color from the mold. If you use it on a dirty glass door it does become clearer you can tell that the bad stuff is still there and it really requires scraping or power scrubbing. It definitely has chlorine inside and is advertised as killing 99% of the bacteria (like any standard disinfectant). Yesterday I managed to score a new toilet seat for 10€, so I finally changed out the old one in my rented flat. 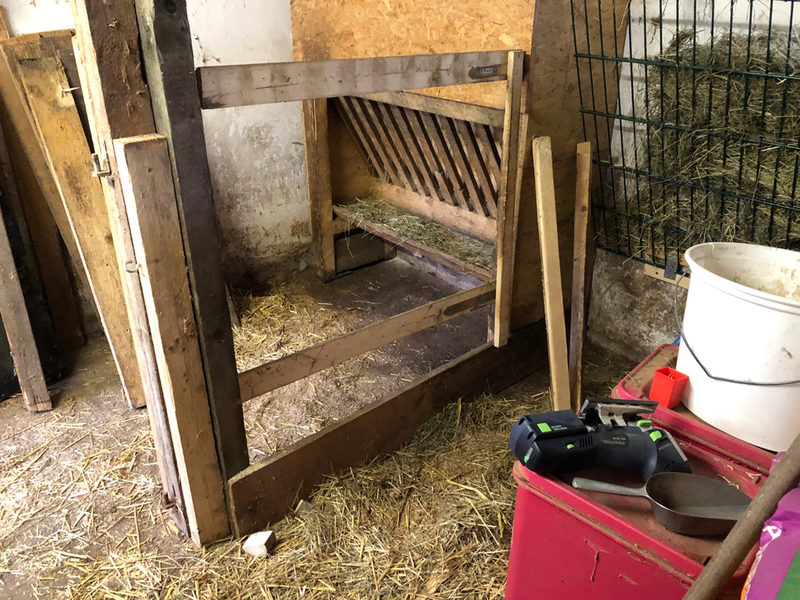 I did not want the hassle of getting the landlord to have this done and I can spare a ten-er for a shiny new lid on the „throne“. 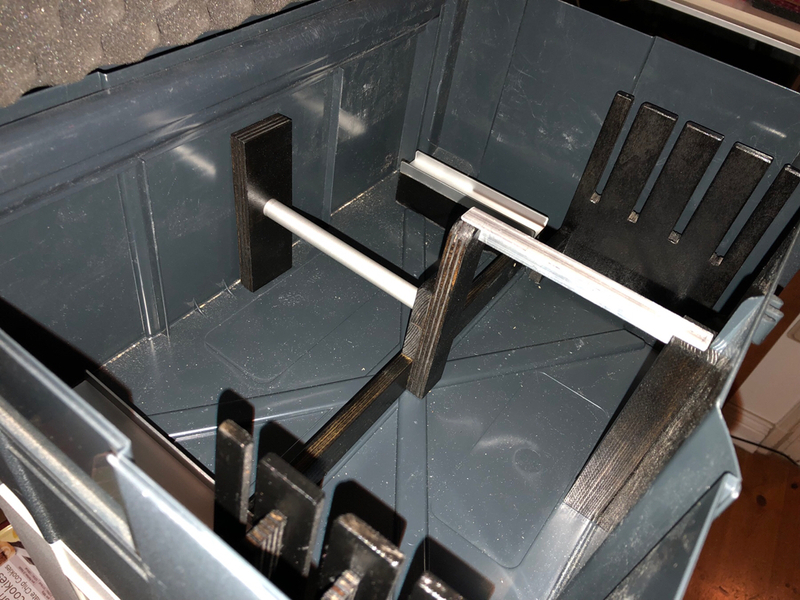 In addition I finally whipped up some scrap storage for the longer wood and Aluminium I have laying around. 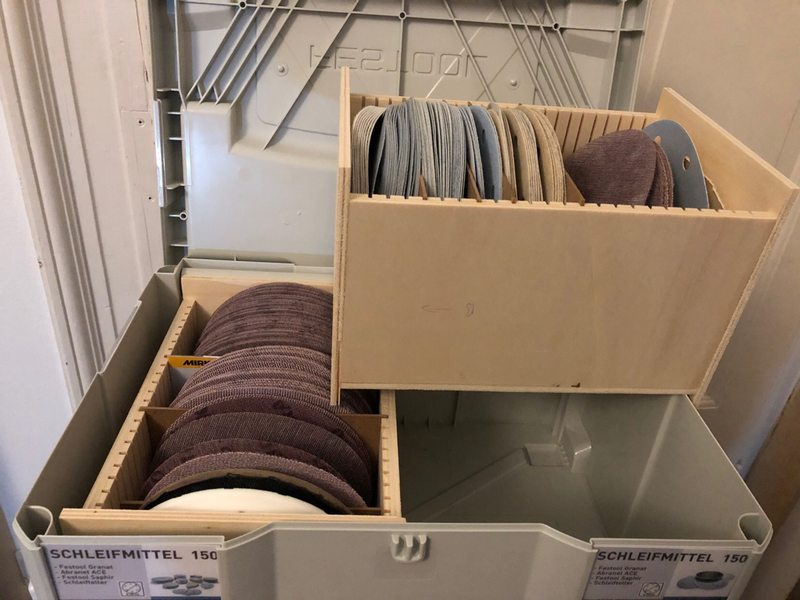 During the last visit to IKEA (I go there once every couple of months to check out the „scrap/clearance area“ for useful stuff..) I got a set of wheels mounted on a metal plate. This was 1€, so no questions asked. It now serves as a means of transport on the scrap storage (other side supported by wooden blocks). This way the whole thing can be moved if needed, but it will most likely stay in place. Storage is made out of air-ducts 150mm diameter and a rectangular air canal cut up to support different lengths. I left some space on one side to be able to also put a couple of boards ontop. Seems to work as intended. How do you know you live in a very, very old house? Lucky me, only a quick short.